The TC Electronic Clarity X has been designed as a monitor controller that offers calibration, metering and protection against hearing loss - particularly useful in broadcast, home studios and post production studios. 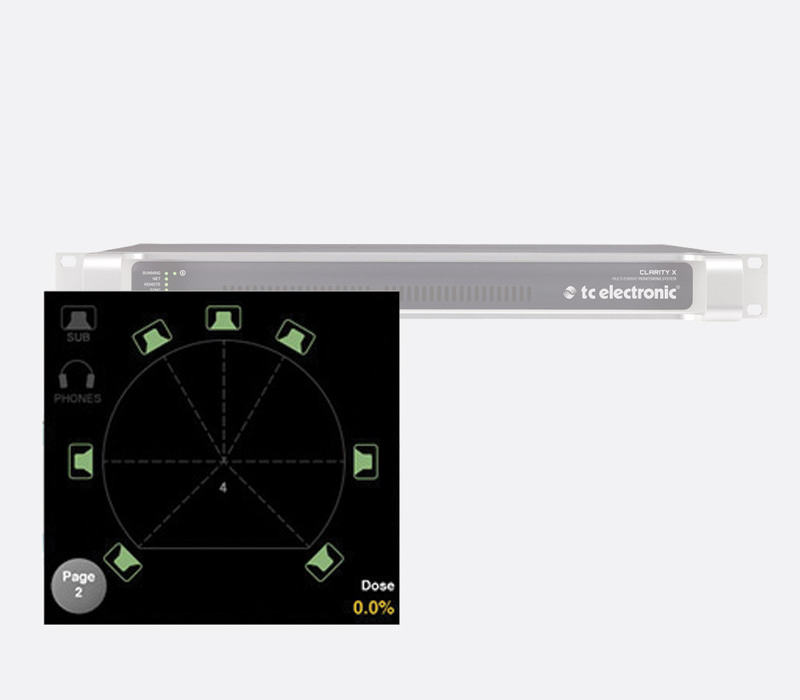 A dedicated remote control is used to control volume and select speakers; access to additional functionality requires either a connection to the TC Icon mkII remote control or a Mac or PC running TC Icon software or an iPad running the available free software. 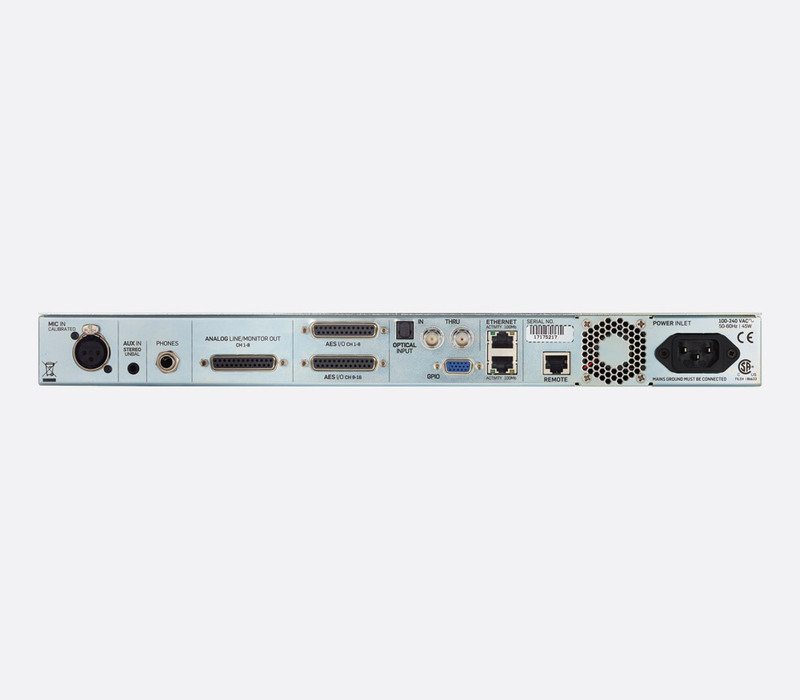 The rear-facing panel of the 1U rack processor houses all input and output connections. 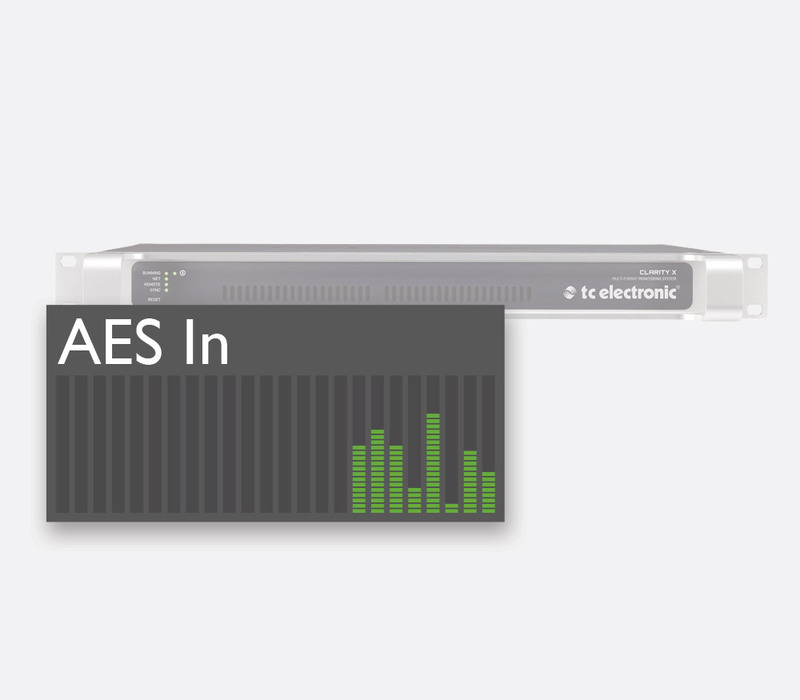 AES/EBU connections are made via two 25-pin female D-Sub connectors, each giving 8 inputs and outputs - channels 1 to 8 as standard and channels 9 to 16 available as an option with the 16 Channel AES Software Licence. 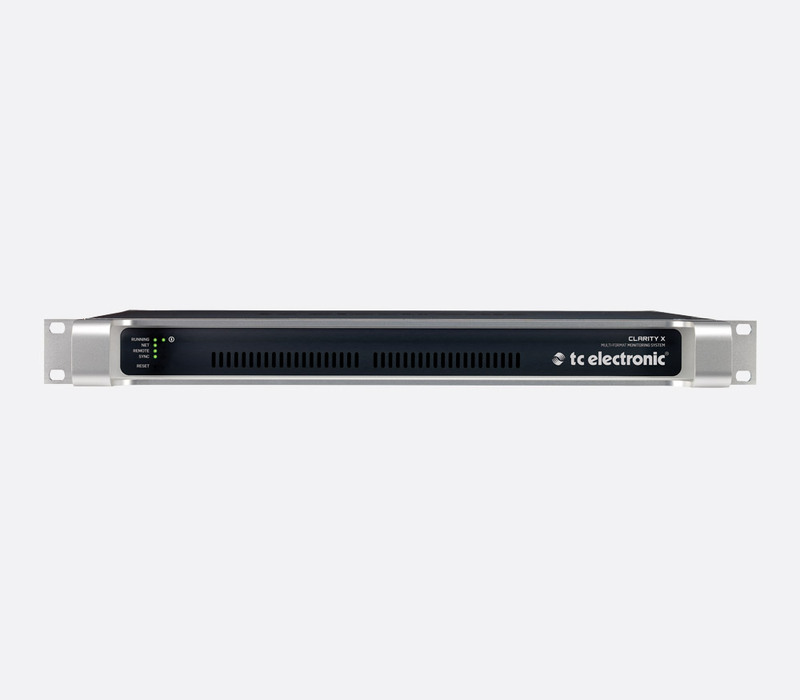 The inputs are handled at 24-bit and are low-latency, with any sample-slips or repeats reported via the connected Icon mkII display. Additionally an optical AES/EBU Toslink input is provided, which handles audio in an identical way to that of the AES inputs. Other connections include an unbalanced stereo 3.5mm jack socket for smart phone connectivity, 3-pin XLR socket for use with the included 3600A reference calibration microphone, GPIO, IEC power inlet, remote connection for supplied remote, 6.3mm (3.4ohm) stereo headphone socket to give the user an independent audio feed that isn't affected by any monitor selections and 2x RJ45 Ethernet connectors for use with external TC Icon Mk II remote or computer. MADI in and through connections are available, however optional MADI software licence is required to access the functionality. A headphone calibration facility that is compatible with headphones from 8 to 600 ohms, lists popular headphones and matches the SPL output for optimum clarity and loudness. If the available headphones aren't listed, the user can manually input the headphone specification parameters for calibration. The monitor calibration facility can be used to set up to three multi-point measurements by connecting the supplied calibrated microphone. During the calibration the distance from each speaker to the microphone and the phase is measured. As room modes may result in fluctuations at the 'sweet spot', three multi-point measurements can be made and an average of the three measurements is then taken, providing a more accurate result. Up to four alternative 'sweet spots' can be added to allow switching - particularly useful when a second person needs to hear the optimum output to assess a mix. 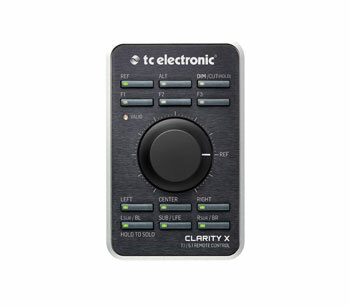 The Clarity X hardware front panel provides no access to any features other than a reset button but has LED indication of the 'Power', 'Running', 'Net', 'Remote' and 'Sync' status. All other visual feedback and references can be seen on a connected computer monitor running Icon software or a connected TC Icon mkII remote. The main view, the one that is first seen when booted, is the dashboard which gives monitoring and a base to control the studio setup. Similar to the Clarity M, the Clarity X shows 'Loudness/True Peak', 'SPL' and includes the broadcast industry standard LUFS, downmix compatibility and stereo deviation. The Clarity X also displays centre-channel balance - which allows the user to monitor the loudness of the centre channel versus the rest of the surround output and 'Dose' usage. 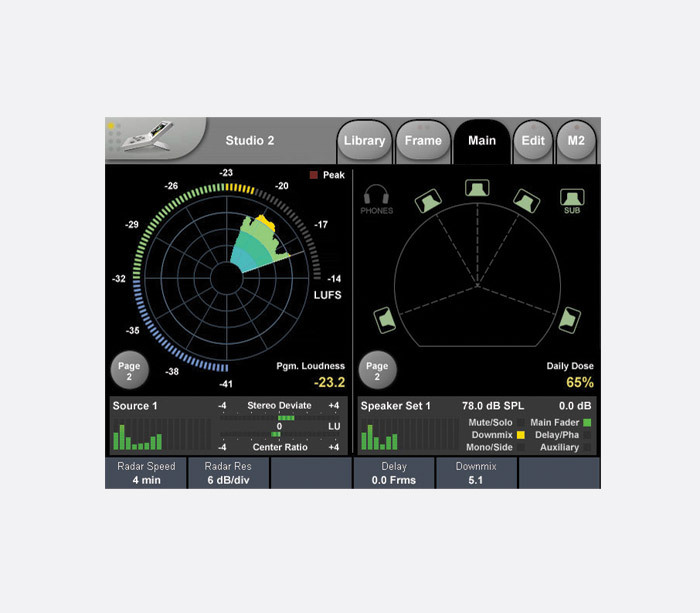 'Dose' usage allows the user to monitor their sound level exposure to calibrated monitors over a period of time, including daily or weekly exposure even when switching between sources and formats. The dose display is shown on a three-quarter circular scale that uses different colours to highlight the exposure level, so that the user can see at a glance if levels need to be reduced or a break needs to be enforced. Power source: 100 - 240V AC, 50-60Hz, 20W. Dimensions: 483 x 44 x 334 (w x h x d) mm. Weight: 4.7kg. 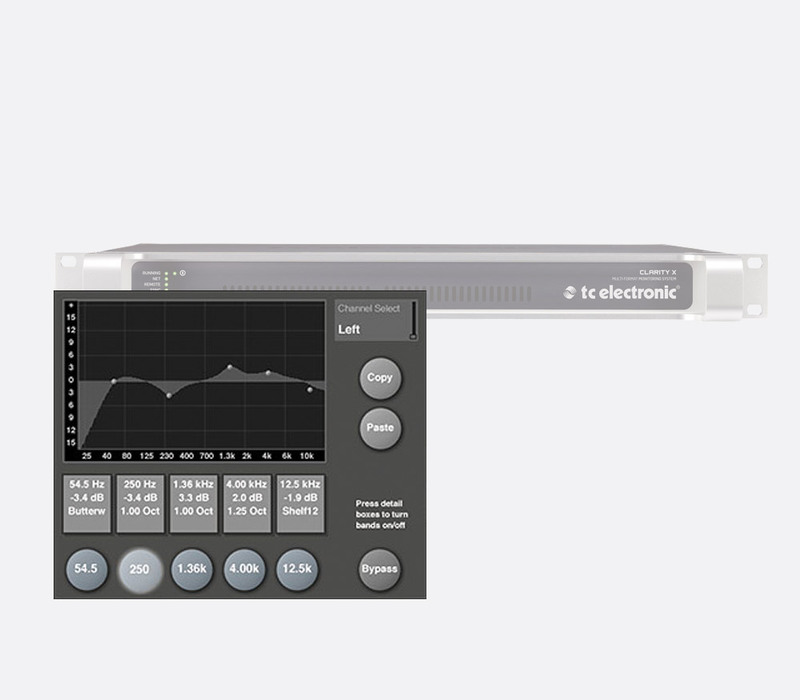 Included accessories: Calibrated 3600A reference microphone, remote control, LAN cable, 7.1 SPK software licence (87-0206), 16 Channel AES software licence (87-0205), EQ ON SPK software licence (87-0207), AES/EBU cable (87-0204) and Analog Out cable (87-0203). This option opens up channels 9-16 of the AES I/O on the Clarity X. This software licence upgrades the Clarity X from stereo and 5.1 surround to 7.1 surround compatibility. Adding this licence gives the user the option to add EQ to any speakers connected to the Clarity X. 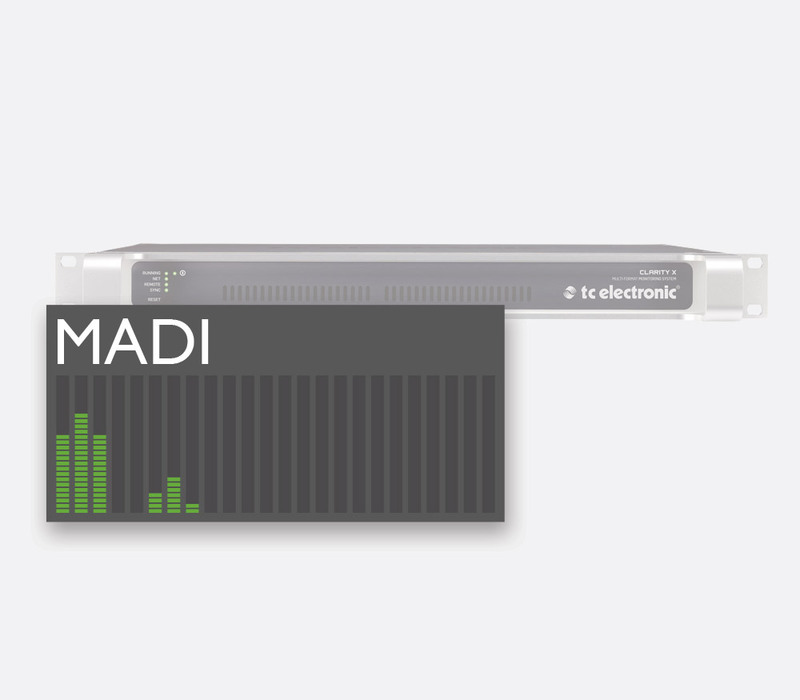 Although the Clarity X is fitted with MADI I/O connections as standard, this licence is required to use them.